Edwardene M. “Edy” Johnson (nee Molson) 91 of Whiting; passed away peacefully on Sunday, November 25, 2018 at the Hammond-Whiting Care Center. She is survived by her beloved husband of 41 years, Ross; loving sister of Francis (late Mary Lois) Molson and the late Tedd Molson, Mamee Molson and Anne Jefchak; proud aunt to many nieces, nephews, great nieces and great nephews; devoted caregiver, Kathy Midkiff. Funeral services will be held on Saturday, December 1, 2018 at 9:30am at the Baran Funeral Home, 1235-119th St., Whiting; a Mass of Christian Burial will be offered at 10:00am at St. John the Baptist Catholic Church, Whiting with the Rev. Stanley J. Dominik, officiating; interment, St. John Cemetery, Hammond; visitation at the funeral home on Friday from 3:00 to 7:00pm. The Knights of Columbus, Pope John XXIII Council 1696 will offer prayers at the funeral home on Friday at 6:00pm. Edwardene Johnson was born on December 5, 1926 in Whiting, Indiana to John and Mary (Tumidalsky) Molson and was a lifelong resident of the Whiting-Robertsdale Community. 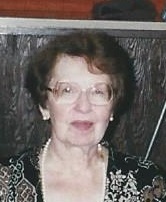 She was a graduate of George Rogers Clark High School, Class of 1944 and was a retiree of Aronberg Jewelers, Whiting with a service of 25 years. She was a member of St. John the Baptist Catholic Church, Whiting, the First Catholic Slovak Ladies Assoc., BR. 81, the Womens Guild of the Calumet College of St. Joseph and was past president of the Sacred Heart Altar and Rosary Society. Edy loved to travel, especially her trips to Calgary, Canada. A devoted wife, sister and aunt, Edy will be sadly missed by all who knew and loved her.